After I bought my iPad, I realized I don’t really use my laptop as much anymore. This means that I really use my desktop a lot a less! Unfortunately, my desktop, which has some decent specs, is in sleep mode most of the time. I thought this was a little sad and a waste of money, so I decided to do some research and figure out some way to utilize it. Previously, I wrote about how you can install Windows 10 on an older PC to revitalize it and that’s something that I did with my desktop. Also, I previously had written about how to automate your computer when you’re not using it to perform certain tasks. In addition to accomplishing these two tasks, I wanted the desktop to be even more useful! After a few days of testing and playing around with software, I can now happily stream music and videos to any web browser or to my smartphone while not being at home! Since my desktop has some extra hard drives, I even turned it into a NAS, also using some free software. Now I can FTP into my server to download/upload files and I can even use it for Time Machine backups for my Mac. Sweet! So here’s a list of programs you can use to convert your boring old PC into something a little more useful. I bought a Synology NAS and even though I’m very happy with it, I realized I can pretty much do everything I want by just installing open-source software onto my desktop! One of the coolest programs out there that I had always heard about, but never used until now, was FreeNAS. It’s basically exactly what its name says: a free NAS OS for your PC, Mac or Linux box. It’s a very capable and powerful OS that also supports additional features via plugins. I was amazed at what I was able to do with this software. Note that if you use FreeNAS on a computer, you really can’t use that computer for anything else. Some of the other programs I mention below run inside Windows. FreeNAS is its own OS and manages all the hard drives installed on the computer, etc. Another thing to note is that FreeNAS is really useful if you have a desktop with several hard drives and a at least 4GB of RAM. The hard drives don’t have to be super fast or giant in size, but the whole point of using FreeNAS is to store files and then to either stream those files or utilize them in some other way. To get your started on your way, check out these FreeNAS guide articles from Lifehacker and Engadget. They walk you through all the steps to setup the NAS and how to setup all the extra functionality like streaming, downloading and more. You can stream any of your media around your house or across the Internet. You can also control the whole gig with a remote control and enjoy a ton of additional features with their large set of add-ons. Kodi.tv is absolutely awesome, but you get the max benefit if you have a small desktop. I have two desktops: one giant Dell and smaller, newer HP desktop. I decided to use the HP desktop and connect it to my HDTV at home running Kodi.tv. It works great, but I realized I could not have done it unless I had that smaller desktop. If you have an older desktop that is fairly large, then you might want to try one of the other programs mentioned below. TVersity is another good choice for media streaming. It used to be free, but now it seems you have to buy a license. They have a free version, but it can’t do any transcoding, which greatly reduces its utility. You can either purchase the Media Server software or the Screen Server software. 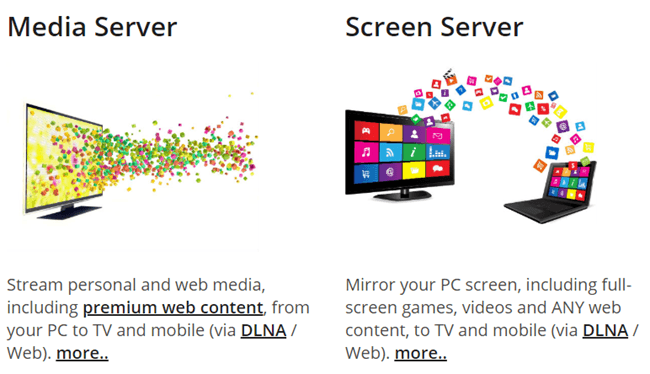 One lets you stream content from your PC to a TV or mobile device and the other lets you mirror your PC screen to a TV or mobile device. For audiophiles with huge music collections, Subsonic is the best way to stream your music all over the place! Subsonic can automatically resample songs that are streaming over the Internet to a bitrate that will prevent songs from skipping or stop playing. What’s awesome about Subsonic is that they have apps for Android, iOS, Windows Phone 7, Roku and lots more. Also, in addition to streaming music, it can stream video as well. However, this program is best suited for music streaming. Not only does VLC Media Player play just about any music or video file you can throw at it, but it also lets you stream music and videos locally over the network or over the Internet! I really never knew this even though I’ve been using the program for 5 years now! Check out the How-to-Geek’s guide to setting up streaming using VLC. It’s not anything fancy, but it gets the job done and since most people already have it installed, it might be worth checking out. Enjoy!